So this may not be the best character trait, and admittedly I may only be posting this on the off chance I can up my posts for the month before tomorrow. I am somewhat addicted to spoilers, I am happy to go around reading TWOP or similar before shows air here. When reading books or other things with endings off in the distance I have been known to skip ahead to find out how things end before going back to reading through the entire book. I realised this once more tonight as I was reading something new, I am trying to fight the urge to skim ahead, I want to find out something about a character, and yet I know I should simply continue reading in a linear fashion. Interestingly I generally do not mind spoiling the ending for myself, however I often want to share, my sister and others have to remind me not to from time to time. A simple warning, if I ever start to tell you some ending early, remind me not to. The weekend just past I camped out on a property up near Nimbin where Matt and Amanda were being married. A lot of us at the wedding were adventure racers, so Matt and Amanda catered well for us, taking us to Mt Warning for a 700 metre vertical hike on Friday then out for night lawn bowls (some unusual activity such as you may find in an urban race) that night. The wedding was on Saturday and then on Sunday we headed down to Byron Bay for the day. The panorama view above is from the deck of Amanda's aunt's house looking over toward the border ranges on the left and the ridge on the right is obscuring Mt Warning (it is at the edge of the Caldera (which can be seen easily from space), we were staying just up above Nimbin. I created the panorama with the program hugin, I have not bothered following the tutorial about balancing the colours better so you can see where the three photos sort of join, however I think the image looks alright, it took a few initial tries to get it to that point. (I have never used hugin before). Anyway great weekend away, thanks Matt and Amanda (and congratulations to you both). The temperature change on our return to Canberra was definitely a shock to the system, it sure was nice up there. Tomorrow it will be three weeks since breaking my collar bone. Before that I had a two and a half week break after Jindabyne in which I had only done a kayak race in Sydney and half the road ride leading up to the crash. Thus I have been a bit edgy and sort of climbing the walls wanting to do some exercise. Finally today I decided I had waited long enough and I would be able to run so long as I was careful of my right arm/shoulder and if I ran on a grass track (predictable, soft surface). So I headed over to the Bilbys track session at Dickson ovals, and oh my god it was wonderful to exercise again, even with the huge shock of getting my heart rate up there for the first time in five weeks. I sure have lost some fitness, previously I could cruise at five minute km pace with my HR sitting around 155, this evening it was sitting at 175 at that pace, then near the end of the session I decided to finish off with a faster lap (around 4 minute pace) (laps were around 600 M with a 50 M warm down (walking for me today) before starting another) and my HR got up to 188, I have never seen it pass 184 since getting the HRM so I sure am down in form. Time for bed now I think, I have just finished packing and preparing stuff for my trip to Queensland tomorrow afternoon for Matt and Amanda's wedding on the weekend. Back in Canberra late Sunday night after that. Soft chocolate chip, apple, coconut cookies (or snickerdoodles) are one of the foods I like to make for racing and long rides. However I am sure many people will appreciate that any cookie is a fairly good food in all manner of situations. Thus I was happy to see this link on Metafilter today, a list of what the author thinks are the 50 best cookie recipes on the Internet. Some of these really do look wonderful, as soon as I can exercise again (and thus burn off excessive amounts of chocolate, sugar and butter) I need to look into trying out a lot of these. I think Crash should show the list to Jo, after all I know she likes to bake the odd yummy item, and he benefits from that anyway. Maybe I should challenge Jo to a long term bake off, we could both bake one of these recipes a week, swap some of the finished product and try them all out over 25 weeks or so. So I suspect this is of course one of the main interaction channels that Barcampers are expected to use, however I am finding it interesting to do it here today. Barcamp is promoted as a place where you sit around with your computers engaging in the content online as well as off line all throughout the day. Part of the online thing is most of the people there will have a web presence, likely a blog of some form. So when I have talked to people during the day, or when someone has given a presentation, I have looked for the link they placed on the Barcamp page and been able to go read some of their blog and see what they talk about more. I probably should participate to the extent of adding myself to the wiki, after all I am here all day. However it is interesting to note Bob and I have both had the same sort of reaction to our involvement. The Unorganisers suggested we all sign up to some yahoogroup or something for more of the discussions leading up to hosting the event. As far as I know Bob did not join, and I did not either, too much effort involved to sign up to another mailing list. So I just had a look at adding my name and diary link to the BarCampCanberra page and to edit the wiki requires a login so I decided not to bother. Sure it makes perfect sense that to edit the page you need to go through some form of authentication to stop spammers and such from blowing the wiki apart. I simply can no overcome my web forum/online login apathy enough to sign in here, kind of strange, though I notice Bob has not done this either. Listening to Dr Stephen Dann (or ANU Page, he really needs to get his staff photo updated as he does not look that silly/wrong I promise) giving a talk about getting his completely non Internet savvy and seemingly not up on modern Internet culture students up to speed on what many of us geeks and Internet people consider normal and everyday. It is a highly amusing presentation, he has been talking about many things we all know and recognise that his students seem to not understand or know about. He mentioned that the Comp Sci students he had the first year or so he ran the course no longer do the subject as they seem to think they do not need it, so all the students are marketing commerce students who do not live in Internet culture. Something that I am reminded of listening to this is that we often forget there are people dissimilar to ourselves out there. For example a somewhat elitist example I often have to remember is that most people in the population are not university educated, however living in Canberra and hanging out with people who generally are, and working at a university, I often forget that not everyone shares my background. Dr Dann is dealing with non Internet savvy people and trying to induct them, it is interesting to hear his experiences. Good talk. On the badges being worn by the people at Barcamp most people in the room have various letters across the bottom that describe what geek things they are involved in in shorthand. The short hand is a geek periodic table of elements that is hanging up on the wall in N101. I was briefly chatting with Kate Carruthers before she headed off to the speed networking session. I instead of being a sociable well adjusted geek and joining in that session remained sitting here typing away on the laptop. Wondering something about the Unorganiser Stephen Collins I headed to the BarCampCanberra1 page to see what he put up there. Realising that people had put their website links on there I paged down and found the Kate Carruthers link there. On her blog there is a link to the Geek Periodic Table of Elements which was created in Sydney a few weeks ago. So the fact that people using the abbreviations on their badges is so prevalent today it had me wondering if there would be a cool way to obfuscate this a little bit (so I admit I like geek in jokes). Alas the symbols on the table are not the same abbreviations as found on the real periodic table so his is not quite as simple as I first hoped. My idea is if you select your list of elements to put on your badge and then could arrange them in such a way as to create materials or more complex things made up of the elements bonded in specific ways. For example water is H2O (two hydrogen molecules bonded to one oxygen molecule), so if you had a drop of water drawn on the bottom of your badge you are indicating your geek interests included H and O (you could even use it as a way to indicate you do H more than O if you want to be exact about this). The idea above falls apart a bit as the letters do not match the elements. However if you wanted to go ahead with this obfuscation you could simply use the elements in the same place on the table as those you select to try and choose various compounds then represent these compounds on your badge rather than the letters them selves. However no one would easily be able to work out what you mean now as they would need to know the chemical make up of the compounds you use, know where those elements are placed on the periodic table and then have memorised the geek periodic table to the extent they know what geek interests are in those positions. This is however a unconference that focuses on cool geeky online apps to some extent, you could fairly quickly extend the geek periodic table to enable translating from a selection of geek elements into a selection of real materials and have some symbol suggestions for the materials. People who want to use the obfuscation could use the tool (in both directions) to work out what is on a badge. So the talk that just finished a few minutes ago was asking why we have not evolved our computer interfaces significantly in the last 40 years. The presenter mentioned the 1968 Douglas Engelbert Demo (definitely recommended watching). A few people in the audience suggested a large part of why alternative interfaces (touch screens etc) are not pushed out to the world at large is the technology and reliability of these devices is still not there for reliable and cost effective deployment. So there are likely to be real uses for the currently accepted interfaces all the time, however the uses of alternative interfaces is likely to apply in a more specific use case scenario, and thus manufacturers, designers, researchers exactly need to somehow align and market them in specific ways and inform the people who want that use of a better (if it really is better) way to use the technology. An amusing aspect that came up for me (from a cycling background) was the question asked why in The Tour de France the UCI has banned recumbents. The person asking the question has obviously drunk the kool-aid on offer from the HPV community on this issue with there constant claims that they are obviously faster and superior for all uses. The reality of this is that they simply can not climb as fast, thus any race with climbing (such as The Tour de France) will make them useless. The reasons they do not climb well is they can not be made as light as a modern diamond frame road bike (they can be easily purchased at 6 KG ready to ride now) and you can not get out of the saddle in a recumbent and really work more muscle groups, the limitations of muscle uses restrict the ability to go hard up hills. Also when climbing with the rather limited motor available in a human body the aerodynamic advantages of a recumbent do not matter at such low speeds and can not overcome the advantages of low weight and more muscle groups. Thus Paul had some basis in suggesting that one reason computer interfaces have not advanced is that they are rather optimal for the purpose, though I strongly tend to agree more with the presenter that computer interfaces have a lot of room for improvement. So a bunch of people were keen to hold a Barcamp in Canberra. Bob and I were asked if we could ask DCS if the event could be hosted here. So Bob and I are here today (with a broken collar bone I am of course unable to do anything active, I had however volunteered to be here today anyway if Bob had been unable to make it) to provide any venue stuff and setup and venue care. So it will be interesting to see how the talks and other stuff go all day, there are a rather large number of people here so it is likely to work well. Right now there is a talk about Meraki on. 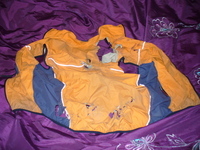 Clothing damage (fullsize) On Wednesday there was mention on Neil Gaiman's blog of a scar on his daughter Maddy's face, Maddy got the scar at 5 and now 7 years later still tells people she got it in a sword fight, which is what, at 5, Neil suggested she tell people. (Maddy since claimed he said "in a sword fight with Spiderman" which seems to have confused him, though he does reference Heidelberg Scars) I thought all of this was fantasticly amusing, that a young girl go around saying she got her scars in a sword fight. Though I probably can not claim the broken collar bone, sustained while tearing up the vest to the left, as a sword fighting injury. I wonder if I can claim the tattered clothing and the scars on my face if any hint of them remain once fully healed as some form of Heidelberg scar. So as I have mentioned from time to time, I am a huge fan of the Doug Anthony All Stars. Since their final tour in 1994 (I saw them live in Canberra when they performed here that time). Of the various projects Tim, Rich and Paul have been involved in since, my favourite by far has been Good News Week. Hosted by Paul (and Tim and Rich have both appeared on episodes of the first series) this is one of the funniest shows ever aired on TV in Australia in my opinion. I used to watch it on ABC and then Ten when the first series was on, I went to some of the live tapings in Canberra, and laughed a hell of a lot. Thus I was of course upset when the original series ended, then I noticed it was back on early this year. At first I thought it must simply be re runs (though reruns of a 7 year old current affairs/news based show do not make sense, so I do not know why I thought that), however by the time the fourth episode was airing I realised it was a brand new series, so I watched it and loved the show as much as ever. Since then I have had my Myth box set to record the show, however for some reason SC Ten is not working on my myth box and I have not worked out why, I missed a few episodes since than and again got to watch it last night. Kristy sent an email to linux-aus asking if anyone had a recording of the show in order to get the bit about Jon's geekiness at the start of the episode. So I ended up having a look at the Good News Week website and was pleasantly surprised to find they have all the episodes of the new series on their video page to watch at any time with flash player. The hidden danger of this is that I then stayed up far too late watching most of the episodes I had missed and some of the other content. The other danger is that when you are watching something this funny and you are laughing so hard you end up crying a lot and you have a broken collar bone, laughing like this can be somewhat painful. Still I love this show, I am so happy it is back on tv now. It is not really Paul that makes the show so good either, it is the stuff the guests and team leaders say that really is so hilarious. Such as the brilliant (though you may need an appreciation for bizarre to like this so much) line from Ross Noble when dissing Doritos. When another guest said they were the best triangular snack with a Mexican twist, Ross pointed out cheese on toast cut in half was just as good, when pressed for a Mexican twist he said you need only put a Chihuahua on the cheese toasty. After all what better triangular snack is there than a cheese toasty with a small dog? This photo on apostropher today is a surprise on a few levels. For a start the author of the placard has never actually looked at the history of the Olympics, or even bothered to google their placard question. 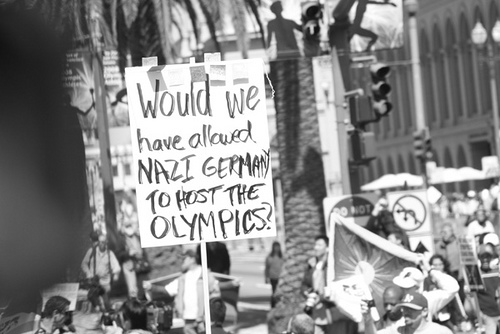 Of course that the placard must have appeared at one of the recent Olympic torch relay protests the even more surprising aspect of this question comes up when you look at the history of the torch relay. The relay of the flame from Greece to the site of the modern games had no ancient precedent and was introduced by Carl Diem, with the support of Adolf Hitler, at the controversial Berlin Olympics as a means to promote Nazi ideology. Heck when the torch came to Sydney in 2000 some students protested the torch relay due to the Nazi origins of the practice. One of my friends works as a physio for elite athletes. Thus she often treats athletes with injuries who are all keen to get back into their sport as soon as possible. She has mentioned there are stages her patients go through when injured. Denial, Depression, Anger and Acceptance. While injured you can apparently float around between all these stages a bit, moving forward and backward as the mood takes you. When I had the stitches in my elbow last year I was still able to do a lot of activities so was not in this situation really. This time of course is different. Maybe I should try to analyse what point in this cycle I am at in any given time. The acceptance stage is in theory the most useful as you accept the injury and simply ask what to do to get better as soon as possible. Then do exactly that, the idea of doing everything you are personally able to to control recovery, after that try to remain positive and simply hope things will improve quickly. I will hopefully learn something about myself going through all of this and should remain thankful it was not significantly worse. From what I have been told by those following in the bunch when I crashed, I actually bounced up off the bitumen on impact. Also Glenn did a somersault or two while clipped in before he hit the ground. Considering that my head was scraping along the ground and we both hit hard in that region we are incredibly lucky we did not do damage to spine or other such major systems around our heads and neither of us suffered concussion. Oh and I have now ordered the pink helmet I mentioned yesterday (though not from Amazon, I bought it from Cambriabike). just before lca2008 this year I saw a fantastic 2 GB usb memory key in the computer shop on campus here at ANU. Around 4mm thick and 1cm by 1.5cm square with a metallic pink top, made by pqi. I bought one and took it with me to Melbourne. However I did not attach it to anything (such as keys or phone) and lifting m wallet out of my pocket one evening in Melbourne it also came out of my pocket and was lost forever. On my return to Canberra I bought another one and all seemed fine. I tied it onto my phone and was able to slip it inside the leather phone cover so it stayed put and was out of the way. This was until last Wednesday morning when I crashed and fractured my collar bone my phone was in a back pocket of my cycle jersey. Though the phone has come out of the crash unscratched and working as well as it was previously. The usb key has a bent pink metal cover and the back of the plastic bit where the chip contacts are is scratched a bit. After seeing APC tests in which the USB keys still often worked after much more severe torture than this one would expect it would still work. Alas I plug the key into a usb slot and nothing happens, definitely dead, tried it in multiple computers with a lot of wiggling around of the key. So small pink usb key junkie that I am I wandered over to the store today and they no longer have the 2GB key in pink, and they rang the importer who also no longer has them, only blue or black which really is not as cool. Thus it appears I am simply not meant to permanently own a cool small pink usb key. I did however see a helmet in the Giro line up that is a rather cool pink, maybe I should get that to replace my broken helmet. So I am being reminded of my issues with using my non dominant hand again. Though this time it is even harder as I have to keep my right arm immobile. Typing is slow, and today I finally overcame the difficulty and slobbishness to shower and shave again. Also with sitting at home a lot I am feeling a need to clean up a bit but really can't. Ahh well hopefully I will remember better when I get well and am back to being out doing stuff more than being home. Steve Barry very kindly visited today (the day before his wedding) in order to give me hand with some tasks around and about today. Very much appreciated friendly gesture there. I hope Steve and Wendy have a great cycle touring south west WA honeymoon next week onwards. Time now to cook some rice to go with a curry I managed to cook (Steve chopped some veggies for me too) today and read more of the newspapers. So road riding has once more proven far more dangerous than mtb. This morning coming downhill through deakin on hopetoun cct in the bilbys medium bunch. I was on the front on the left with glen next to me on the right. Riding fairly fast into the bumpy roundabout above the shops I took a very wide line to give glen more space. My wheels lost grip on the bumps and slid into and bounced off the gutter. I left the bike at some point and landed on my right shoulder. My bike bounced into the middle of the road in time for Glen to go over it and get launched over his bars also onto his right shoulder. Tony also came down behind us and did some damage to his fingers. I have fractured my right collar bone and also had to get three stitches around my right eye brow. I have a sling and have to keep the right arm immobile for a week then will slowly regain movement. Glen has a level 3 dislocation of his AC joint and is in a fair amount of pain. Drugs are helping him with this. (Ron will know what this is like as it looks similar on his shoulder to Ron's dislocation from the mugga loop a few years back). I am now at home and Glen should be home soon, he is very happy no Surgery will be required. Glen will also need to keep his right arm immobile, for two weeks, then do some extensive physio for awhile. Thanks to Browny, Tony and the other riders who have helped today. Thanks to Dr Julia and the others at the hospital. Lets hope i get better soon and can get back out there. Oh also the mtb skills clinic should be able to go ahead this weekend. I think I can find another coach to replace me. Typing with the left hand only is slow and difficult so I will save you all from reading a longer blurb. Stay safe and ride mountain bikes kids. I just had a delightful surprise when I saw a feed with new posts in my feed reader. It is possible Fafblog is back. The first post to the site in almost two years appeared today, then another one appeared. It has been suggested that they are messing with us, it being April 1 and all. However there has been a fafblog redesign from the green look to a new look. Lets hope Fafblog is back for real.